Knox Upholstery is a custom furniture reupholstery workroom catering to the discerning private client by a skilled Artisan, located in Knoxville, Tennessee. Commissions are currently being accepted for antique, mid-century modern and contemporary furniture frames. We are a small operation, so you can trust that each piece will be hand-crafted and personally cared for by Rachel Fletcher and not worked on, piece by piece by different individuals that may, or may not, take the same care for your furniture as you would. 2019 speaker and master-class line-up for the Custom Workroom Conference & trade show. Rachel Fletcher, of Knox Upholstery, has been chosen to teach 2 masterclasses at the Custom Workroom Conference September 2019. In addition to the classes she will take part in a symposium before the event with other Master’s of the upholstery trade. Knox Upholstery was recently interviewed for an article in KnoxNews.com, “Knox Upholstery: Craftsman's work in a 'throwaway culture’”, by Hanna Lustig. Published: January 31, 2019. In the continued pursuit of on-going education, and a chance to rub elbows with some of the craft’s top master upholsterers, Rachel will attend an intensive training course under the renowned Master, Bruno Paulin Lopez to learn the famous Herter Brothers’ techniques for sprung chairs. If you know Rachel, you’ll understand how excited she is to take this course at the amazing DeAngelis, Ltd. Ateliers of Custom Upholstery and Fine Drapery, in Glen Head, NY. Knox Upholstery/Rachel Fletcher is a co-moderator and very active participant of the sought-after Professional Upholsterer’s Network which boasts over 2,000 global professional upholsterers online - a place where the pro can go for camaraderie, support and get answers from a very knowledgeable collective from across the globe. Check out the page owner of the PUN - A Chick & A Chair and co-mod Felix Hart for more upholstery mastery and inspiration. Rachel is currently involved with a select group of international collaborators that focuses on issues related to the future of the upholstery trade. We recently made some history in Tyron, North Carolina, so keep tuned to this space about future developments. Rachel Fletcher is a professional furniture upholsterer located in Knoxville, Tennessee. 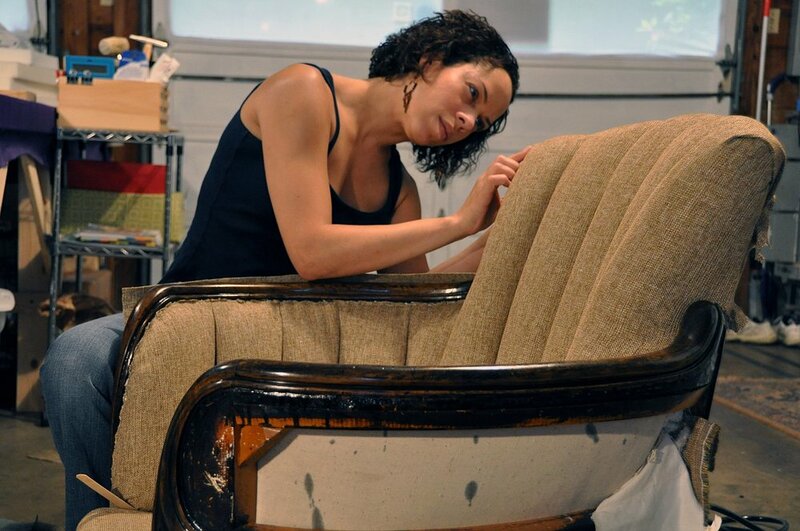 Starting out as the sole upholsterer for the Clarence Brown at the University of Tennessee she has upholstered a variety of historical and contemporary furnishings. Since striking out on her own Rachel has grown her business and now serves the entire Knoxville community and surrounding areas. Although Rachel's background includes marketing and advertising she has always been a hands-on creative soul. Her true passion is ripping into furniture to breathe new life into it. In 2012, Rachel was sought out by a Design Producer at Extreme Makeover Home Edition to produce numerous upholstered items for the show while shooting in Knoxville, Tennessee. In 2013, Rachel was surprised to find her photo on the front page of the New Sentinel while paying for some gas at the local Pilot, with a subsequent article detailing her work and her photography. You can find the link here. In 2016, Rachel was commissioned to upholster several Nick At Nite, SNICK, Couches For Nickelodeon. In 2017, Knox Upholstery was voted “Best Of'“ on Houzz! noun - a worker in a skilled trade, especially one that involves making things by hand.